Granddaddy William Edward Lewis paid $700 for land at the Fort Fisher columns from the river to the ocean, brought his family from Shallotte, and died about a year later (1903) when his boat turned over. His two sons, Crawford and Ed Lewis (born in 1904), married and lived at Fort Fisher. Son Crawford Lewis and wife Ruth lived on Fort Fisher Road just right of the columns (Fort Fisher Gates) on the way to the river. One way to take fish to Wilmington was to row a boat. Crawford Lewis, Bud Waters, and others helped LC Kure build the pier in 1923. When son Jack was born in the 1930s, Crawford was helping build the loop road across the bridge around the right side to Wrightsville Beach. He also worked at Ethyl Dow for many years. Crawford’s house had three bed rooms, a bathroom, a long kitchen and front room. When son Jack was 12, the wood stove was replaced with a kerosene stove. They grew lots of hot peppers, made hot pepper vinegar, stayed busy canning, and had an ice box. They had no electricity and used kerosene lamps. Well water was for drinking, bathing in a washtub, scrubbing clothes with a washboard and drying on an outdoor clothes lines. They had chickens, a woods full of wild hogs, and lots of fish and shell fish nearby. Ed Lewis, Crawford’s youngest brother, Ed was born in 1904 just after their father drowned in the river. 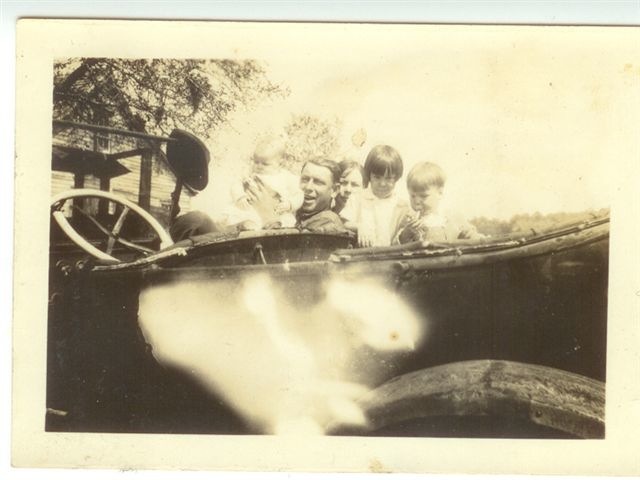 Ed, his wife Gertie, and their four children – Anna Lee (Sis), James Edward Jr. (Brother), Isabell, and Judy lived between Crawford’s house and the river on a beautiful little knoll. The house had a living room, two bed rooms, and a kitchen on the first floor and a bedroom up stairs. The family had an old wood stove, later kerosene, to heat water for bathing in a big tin tub in the kitchen. Toilets were outhouses. The Rural Free Delivery (RFD) mail box was at the road edge. Aladdin Oil Lamps provided light until they got electricity at the river home when Isabell was nine years old (1939); and a phone when they moved to the store in Kure Beach in the 40s. Before electricity, Ed listened to the news from Walter Winchell on his crystal radio set. After electricity in 1939 the kids listened to radio shows such as The Shadow Knows, The Lone Ranger, and The Creaking Door. In the 1930’s Ed Lewis had cows he took on a barge to one of the islands with good vegetation. They had pig killings with all of the neighbors. Down on the river they had cows and pigs, ducks, chickens, and things from the water – a lot of clams, oysters, duck, fish and birds, and all kinds of wild life food. Ed Lewis said his mother would give him one shot gun shell and tell him to go get supper. If he was going duck hunting, he’d wait till he got 2 or 3 lined up so that he could get them with one shell. He did exaggerate at times.